Modern, yet classic! Fun and sophisticated! Its a dress that puts a spin on tradition. You will fall in love with it the moment you put it on as I did. Its comfortable, which was one of my requirements. It allows you to move, dance and sit without fainting. One of my favorite things about this beauty is the way it looks when you spin. The cascading skirt looks stunning as you move around. I'm 6ft tall and this dress was perfect with flats and will be a great length for anyone over 5' 6"- 6'. 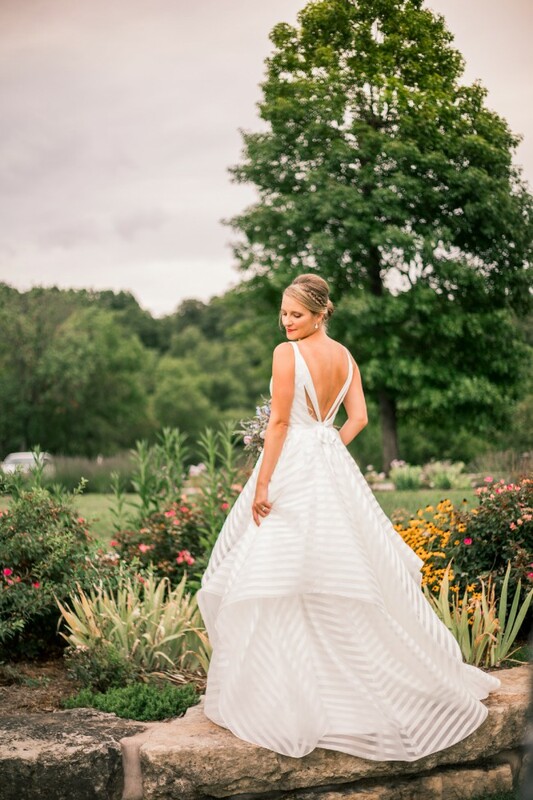 Described as "Ivory striped organza ball gown, draped ballerina bodice with curved V-neckline, open back with cut-out detail, full cascading skirt."